William Gmeiner, PhD, MBA, develops novel compounds and drug delivery systems that are more effective and have fewer side effects in the treatment of cancer than common chemotherapy drugs. His partnerships with industry focus on developing targeted treatments for cancers such as prostate cancer, acute myeloid leukemia, glioblastoma and breast cancer. 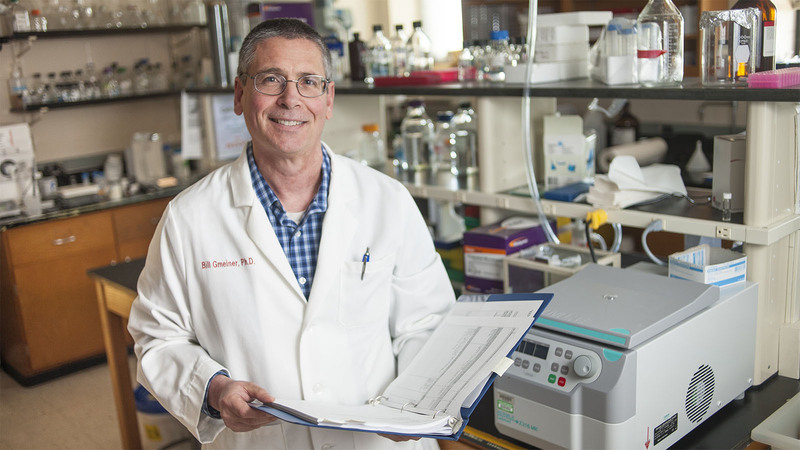 William Gmeiner, PhD, MBA, earned his doctorate from the University of Utah in 1989 and worked at the Eppley Institute for Cancer Research at the University of Nebraska Medical Center for nine years before joining the cancer biology department at Wake Forest School of Medicine in 2000. He earned a master’s in business administration from Wake Forest University in 2007. Gmeiner’s early breakthrough was based on a National Cancer Institute-funded grant in which he studied how anticancer drugs cause cancer cell death and developed a compound, FdUMP, that laboratory studies have shown to be more effective and have fewer side effects than fluorouracil, one of the most common chemotherapy drugs for cancer. His research also demonstrated that FdUMP had efficacy in leukemia and colon cancer cells. In 2012, Gmeiner and his colleague Timothy Pardee, PhD, MD, established in animal models that FdUMP is as effective as and less toxic than standard chemotherapies that treat acute myeloid leukemia. Based on this work, Gmeiner founded Salzburg Therapeutics, a company that develops cytotoxamer technology built directly from anticancer drugs in order to selectively target malignant cancer cells. Other anticancer research that Gmeiner conducts includes the treatment of prostate cancer with a cancer cell-targeted zinc compound and the use of porphyrin DNA nanoparticles in cancer treatment. Gmeiner tailors his ideas and research to suit the needs of large pharmaceutical companies and investors. He seeks partnerships with companies developing new compounds or novel targeted delivery systems to treat a range of cancers, including prostate cancer, acute myeloid leukemia, glioblastoma and breast cancer.